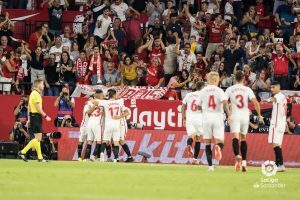 LaLiga pulled all the stops out for the broadcast of last weekend’s match between arch rivals, Sevilla and Betis. The famous clash between the two Spanish clubs received the best coverage in its history on Saturday 13 April, supported by LaLiga’s top technological innovations. 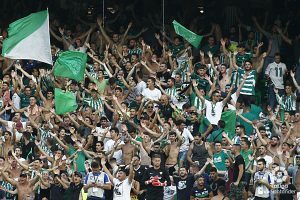 The historic rivalry between Sevilla FC and Real Betis means that ‘El Gran Derbi’ has a famous reputation and generates great interest globally. To that end, LaLiga rolled out its best audio visual broadcasting technology to provide viewers with the best experience of the match. This audio visual deployment allowed El Gran Derbi to be enjoyed via the international feed, which was distributed in 183 countries around the world through 93 television broadcasters. Match production was provided in 4K HDR via 22 cameras, including an aerial camera. In addition, the Replays360 system was available with five super slow motion cameras capturing every detail. LaLiga has pioneered the use of Replay360, which allows users to recreate 3D replays of any move and give viewers a unique perspective from any angle. Replay360 uses 38 cameras installed throughout a stadium to allow spectators to fly over the action or even position themselves from the point of view of a player. Six LaLiga stadiums already have this technology, and more will receive it for next season; in season 17/18 four stadiums had it: FC Barcelona (Camp Nou); Real Madrid (Santiago Bernabeu); Atlético de Madrid (Wanda Metropolitano); and Sevilla FC (Ramon Sánchez Pijuan). During this season two additional stadiums will receive it: Athletic Club de Bilbao (San Mamés); and Valencia CF (Mestalla). Going forward to season 19/20, two more stadiums will receive the system: Real Sociedad (Anoeta); and Betis (Benito Villamarin). Meanwhile, at last weekend’s match, live 3D graphics were also used, as well as the Lawo Kick System to provide the most accurate on-the-pitch sounds. Additionally, LaLiga organised distinct events to celebrate the match and the two clubs in the US, Mexico, Brazil and Colombia. Promotion of the match kicked off on 9 April with an event in New York that discussed the importance of El Gran Derbi and the efforts being made by the clubs and LaLiga to achieve growth in the US. On the day of the match, three concurrent ‘viewing parties’ took place across the Americas in Bogota (Colombia), Sao Paulo (Brazil) and Mexico City. “The events we are holding in different parts of the world form part of LaLiga’s international development strategy with the objective of growing football globally. El Gran Derbi is one of the biggest matches of the season, which is why we want to get closer and closer to our fans around the world so they can enjoy the occasion,” remarked Oscar Mayo, LaLiga’s director of international development. “LaLiga’s derbies are hugely important for the international development of the competition. We’re making the most of the emotion, passion and rivalry in these games to continue promoting the international growth of the clubs and the competition,” Mayo said.